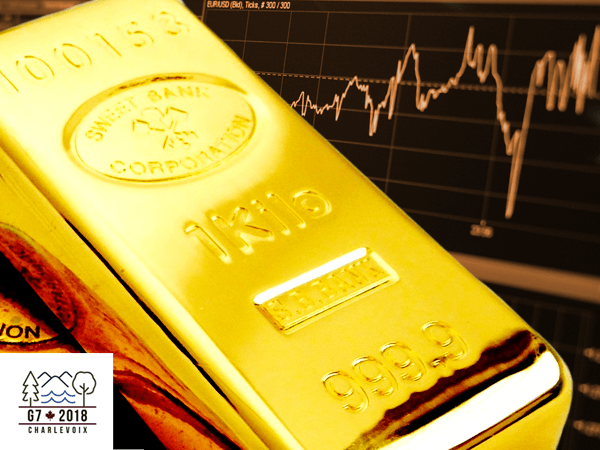 This week, Your News to Know brings you the latest stories involving the gold market and overall economy. Stories include: Gold to reach $1,400 by this time next year, inflationary tariffs could supercharge the yellow metal, and Russia to become world’s second-biggest gold producer. As gold braces for what could be another round of tensions in the wake of the G7 summit, analysts from one major bank point to the metal’s long-term forecast as the true source of optimism reports a recent Kitco article. In a recent note, ING’s team explained why gold should already sit above current levels and why the metal will average $1,400 an ounce during the second quarter of 2019. Trade tensions, geopolitical conflicts and lower bond yields are all factors that the metal stands to benefit from by a much wider margin, said Oliver Nugent, ING’s commodities strategist. Their continuation could guarantee enough positive developments for the metal, along with some other factors that could stimulate gold further. The possibility that the inflation rate will go well beyond the Fed’s targeted rate of 2% is a major boon for gold, as the metal would reap benefits from both higher prices and a shift in market sentiment. The bank believes inflation will continue moving up, which should combine with lower bond yields to provide strong support for the metal. Gold’s fundamentals are likewise promising, with the recent 2% increase in Swiss gold exports for the first four months of 2018 suggesting an uptick in China’s already-massive demand. Over the shorter term, ING’s team said that a lack of consensus by G7 members could further erode the dollar, giving gold prices even more room to grow. In his latest piece on MarketSlant, investor and publisher Frank Holmes wonders whether higher tariffs will undermine the economy and lead to a sizeable surge in inflation. As Holmes notes, Treasury Secretary Steven Mnuchin’s words of reassurance go against recent decisions by the Trump administration. The latter confirmed that the U.S. plans to increase tariffs on Chinese goods by 25%, which would affect roughly $50 billion of Chinese imports. The White House further reinstated tariffs on metal imports from Canada, Mexico and the EU after previously exempting the nations. Holmes sees little doubt that these actions will lead to retaliation from each of the affected countries. With steel prices up 45% compared to a year ago, Holmes thinks that the world economies could be facing an inflationary turning point. According to him, both producers and consumers are bound to see a palpable increase in prices as countries scramble to curb imports. This will offset any positive changes President Trump has made to the U.S. bureaucracy as the decrease in regulations is met by higher tariffs, which have a similarly constraining effect. It doesn’t take an overwhelming rise in inflation for gold to start trending up. Holmes notes that a 3% inflation rate has historically translated to an annual gold return of 15% on average. Given that inflation in the U.S. already sits at 2.5% with a strong uptrend, Trump’s policy of protectionism could benefit gold sooner rather than later. Holmes also points out that gold’s all-time high of $1,900 an ounce was achieved during a time when inflation rose nearly 4% year-on-year. In contrast, Treasury yields dropped into negative territory during the period, forcing bond holders to pay the government to store their money. One of the world’s biggest gold hoarders could soon expand its ore production and double its mining efforts within the next decade says an article on Newsmax. Besides regular multi-ton bullion acquisitions by its central bank, Russia also places great importance on ore discovery, having mined 8.8 million ounces of gold in 2017. As per a recent report in Russia Times, new discoveries of gold deposits will allow Russia to extract an additional 8 million ounces of ore annually by 2030. This would improve the country’s global gold miner rating and allow it to take the spot of the world’s second-biggest producer of gold. It currently occupies third place, having mined 2,189 tons of gold in the last ten years. The expected increase in production is all the more notable given that Russia has doubled its ore extraction in the last two decades. The announcement comes at a time when analysts and market watchers are preparing for a spike in gold prices going into the new year. Bart Melek, global head of commodity strategy at TD Securities, predicts a steady uptrend in gold prices as we move closer to 2019. In his interview with Bloomberg, the analyst said that the metal will average $1,375 an ounce in the fourth quarter of 2019, with potential to reach $1,400 ounce within the year. Melek believes that a weaker dollar will be the main driver behind the price increase. Nicholas Frappell, global general manager at Sydney-based ABC Bullion, sees gold ending the year strongly and enjoying a potentially stellar 2019 as the Fed’s tightening cycle comes to a close. “Looking forward, the conditions for the gold market look more positive as the dollar rally becomes more stale and fiscal factors start to erode the dollar’s strength,” Frappell said.